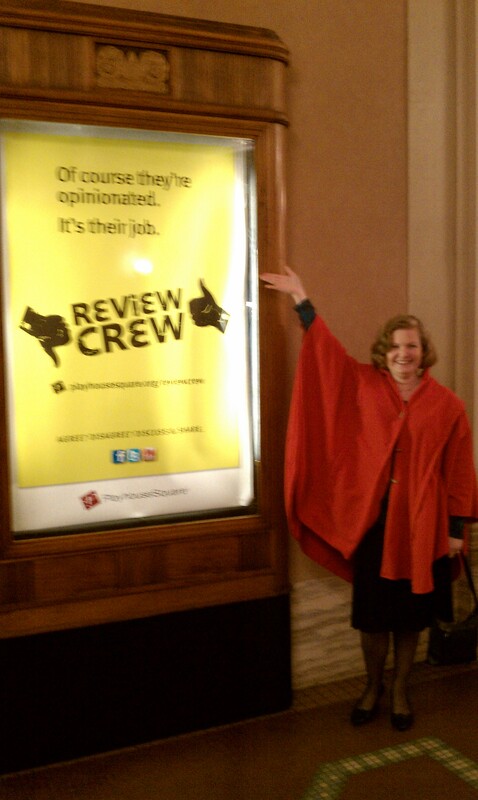 A few weeks ago, I was selected to be a member of Playhouse Square’s REVIEW CREW – 8 regular folks who have the oh-so-hard job of watching every show in the 2010-2011 KeyBank Broadway Series on opening night and sharing our opinions on video! Oh, and did I mention that we all got tee-shirts & goody bags and that the tickets for our seats and one guest are FREE?! I will be blogging about all the shows from now until June. Tonight was the kick-off to the season with Blue Man Group – and what a spectacular and high-energy kick-off it was! I’d done my homework by reviewing the trailers on the Playhouse Square website, checking out Wikipedia, and talking to friends on Facebook, Twitter, and Plurk who have seen one of the BMG shows over the last 25 years. But I was still unprepared for the absolutely seamless blend of technology and humanity, the simple but profound social commentary, and the exuberance and silly fun of the show! It is impossible, really, to adequately describe the sensory EXPERIENCE of the Blue Man Group show. It absolutely must be witnessed LIVE in the same way that performance art must be experienced. It definitely evokes facets of Cirque de Soleil in its theatricality, diverse use of lighting, and bold, wild colors. Its use of technology is striking and as non-traditional and game changing as The Lion King’s use of puppets. Traditional theatrical techniques and props such as scrims, screens, and creative lighting folded into more contemporary ones such as gigantic SmartPhones, interactive video, performance art, neon, and audience participation! The show started simply, with a huge projected slide stating how different cultures can meet and grow to understand each other by creating art together, sharing experiences together. That message was subtly but profoundly woven throughout the entire performance. It was not at all hard to suspend disbelief and become mesmerized by the child-like innocence, curiosity, and wonder evoked by the silent gestures and movements of all the Blue Men. Their facial reactions, hairless blue heads, stoic expressions, and carefully choreographed body movements all created – without any words at all – an impression of non-threatening foreignness and unpredictability that had the entire audience on the edge of its seat wondering just what was going to happen next. The show is an hour and 40 minutes long with no intermission. However, the time flies and you won’t notice the lack (unless you have a small bladder). Honestly, the only part of the show I disliked was the interminable string of colloquialisms for one’s “posterior.” The vast array of works and phrases – and I do mean vast! – was shown on the screen and read aloud when the audience was encouraged to get off said body part and “shake it” to simulate the world’s largest dance party. It was completely funny the FIRST time the words spewed forth, but got less amusing as it went on and on ad nauseum. But in general, the air of joie de vivre and downright goofiness that permeates the entire show leaves you feeling energized and cleansed. I strongly suggest arriving early, for example, because if you arrive late, the entire show STOPS and a spotlight is turned on you as you walk down the aisle to your seat! (And confess it now, don’t you sometimes want to do that yourself to people who are very late for a performance?!). But nothing tops the sheer ebullience of the grand finale. I don’t want to spoil it for you, but there are 4 or 5 things happening at once and like a child who is overwhelmed by the glory of it, you barely know where to look and you sure don’t want it to end. Blue Man Group performances run until October 17, 2010 at the Palace Theatre at Playhouse Square in Cleveland. Call the Playhouse Square Box Office at 216-241-6000 or order online to get your tickets NOW before this spectacular sensory adventure leaves town! The next show in the series is “Billy Elliot, The Musical” which opens on Sunday, November 21, 2010. What a blast! I’d love to see the show. I enjoyed your review, too!